Looks beautiful and good quality. We just order my daughter a queen size bed (she used to have a twin) and I am reordering the same comforter set. Make a statement with the Intelligent Design Odette Boho Comforter Set. 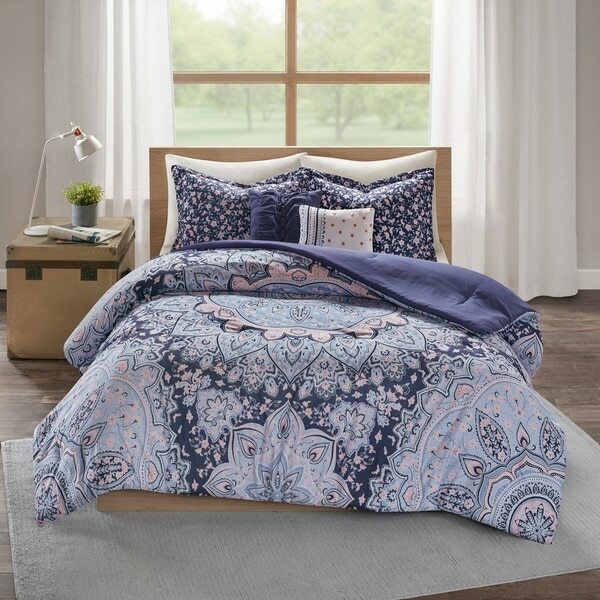 A gorgeous over-scaled medallion, complemented with floral accents, is printed on the face of the comforter in bold navy hues. A solid navy reverse adds a rich touch of color to coordinate with the top of the bed, while coordinating sham(s) feature a floral print to provide a charming accent. Two decorative pillows, one with fabric manipulation and another with multi-colored embroidery, offers the perfect finishing touches to the set. Machine washable for easy care, this boho comforter set will set the perfect ambiance in your bedroom. I love this set! I bought it for my granddaughter for college dorm room. It was perfect and i love the decor pillows included in this set! This comforter set looks awesome. I highly recommend this set. It looks a lot more expensive than it was. The colors are true to the description. I really like this brand now. I am so so happy with this comforter set. It looks even better on my bed than I would have imagined from the photo online. It does have a lot of pink in it, which is not obvious from the description or photo online. But I am quite happy with the pink, it makes a nice background for the navy and lighter blue. It is a nice weight. With my thermostat set on 68F for sleep, and cotton jammies, it had the perfect warmth. OH MY GOSH!! This is the SOFTEST comforter I've ever bought!! Material is silky and so soft to the touch! Design is beautiful! Do not hesitate in buying this - I have nothing bad to say about it! 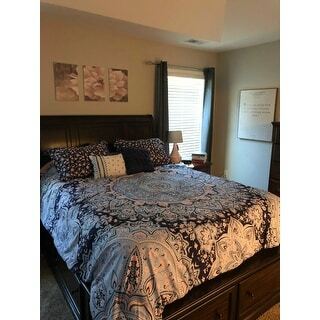 My daughter loves this bedding, the colors are true to what is shown in pictures. nice quality for the money spent. happy with my purchase, recommend. Love it! Exactly what I was looking for to tie my room together.